I look around at my hallway console nowadays and see a Canary camera, a Google Home, and a SmartThings Hub v2. Not to mention the Synology server, router, and a few other miscellaneous tech items. The idea of having all three integrated in the same device, saving space and unnecessary wiring is quite appealing, and that's what Toshiba's new Symbio aims to do. It's a 6-in-1 device: a 1080p wide-angle "low-light" camera with sound and motion alerts, a smart sound detector for babies and pets and even legacy alarms around the house, a Bluetooth and WiFi streaming speaker with ODMD driver, a voice control interface with Amazon Alexa built-in, a smart home hub with ZigBee and Z-Wave radios, and an intercom for communicating between Symbios and phones. The idea seems super appealing, like an Echo Plus on steroids, and there are a few neat ideas in there, such as the physical camera privacy cover, the included siren, the temperature, humidy, and ambient light sensors, and the fact that all of it uses a single app instead of you having to deal with multiple apps for separate devices. But the spec details and execution leave me with my eyebrows raised. There's no mention of a proper PIR motion detector, just motion-based alerts, so we can't be sure if it's software or hardware doing the job. Also no mention of proper night vision, just "low-light camera." Again, it could be there, but the specs aren't clear. The speaker's specs aren't well detailed either, the Android app's Play Store listing shows all of 2 screenshots taken on iOS (ugh), and finally, the many smart devices supported are listed on this page but it's a really slim pick of ZigBee and Z-Wave sensors, with WiFi devices being relegated to control through Alexa. Add the fact that Amazon doesn't open up all Alexa capabilities to its partners, or it takes months for them to get features after the Echo devices, and the proposition loses its appeal. So sure, the Symbio is interesting if you want a little bit of everything in one device, but if you want the best of everything, you're going to have to buy each device separately. In any case, if you're interested, the Toshiba Symbio is available now on Amazon and costs $249.99. You can grab it from the link below. 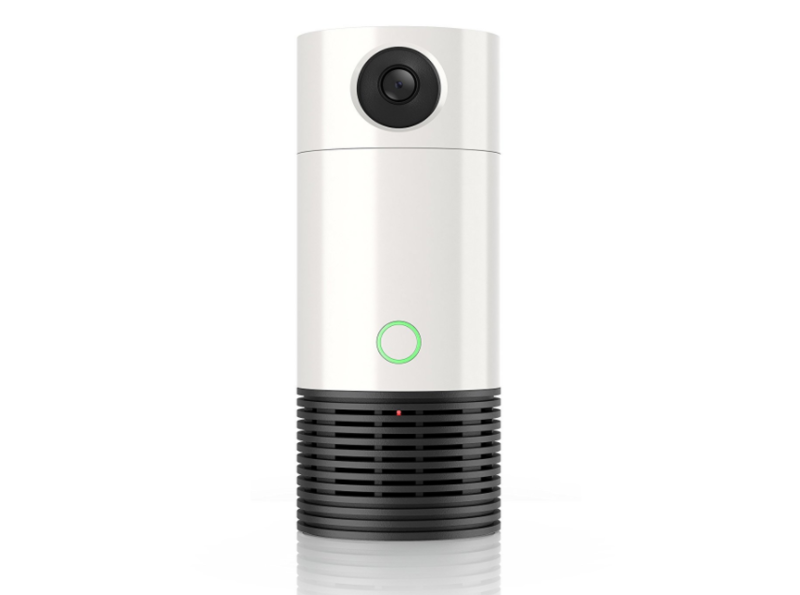 IRVINE, Calif.--(BUSINESS WIRE)--Toshiba Visual Solutions Corporation has announced the U.S. release of the new Symbio™ multi-function smart home solution, delivering the capabilities of six products—a wireless security camera, smart speaker, voice control with Amazon® Alexa, an intercom, smart sound detector and an expandable smart home hub—all in a single elegant device. By consolidating multiple smart home functions into one solution, Symbio™eliminates the need to purchase and control multiple devices, giving consumers more value for their money and empowering users to manage their smart home quickly and easily with their voice or a simple touch. All Symbio™ functionality is controlled through a single, user-friendly app, which works with iOS and Android™ smartphones. The Toshiba Smart Home App turns a smartphone into a remote control for all Toshiba Symbio™ connected smart home devices. With the app, users have full control over everything from lights and music to door locks and temperature settings, from any location—at home, at the office or out of town. 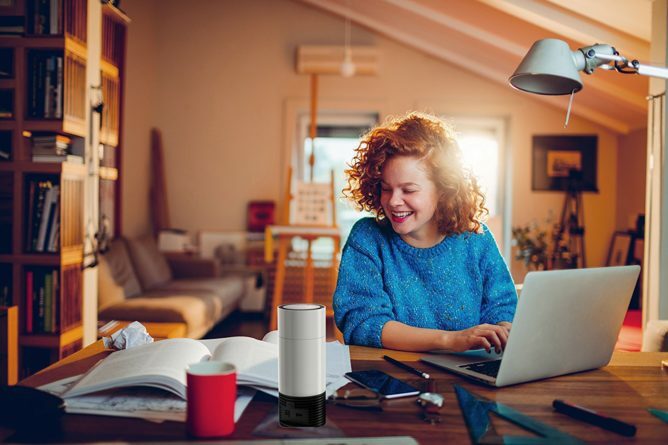 Symbio™ also functions as a smart home hub, which accommodates many connected devices powered by Z-Wave® or ZigBee®wireless technology, the wireless communications protocol used in hundreds of home automation devices. With a growing number of devices available today, and more being continually introduced, users can easily expand and customize their home with additional smart devices over time. Essentially, with one simple device, Symbio™ can deliver a smart home experience that previously required professionally installed systems. Smart Speaker: Integrated full-range speaker offers built-in access to Bluetooth® or almost limitless streaming music from leading services like Amazon Music, Pandora® and iHeart Radio®. Features an exclusive ODMD (Onkyo Double Molding Diaphragm) high-excursion driver to deliver rich, immersive sound. Touch-free Voice Control with Amazon® Alexa: With simple voice commands, Alexa can answer questions, play music, provide news updates and control lights, temperature and more. Smart Home Hub: Allows your Symbio™ to connect and control additional sensors and devices. Easily expand your system over time with a variety of third-party IoT devices. Intercom: Offers built-in microphones and speaker to enable two-way communication between Symbio™ and your smartphones. In addition to retail sales, the power and flexibility of Symbio™ makes it an ideal solution for those interested in launching “smart-home” related services such as home automation, security or providing access for curated service providers. For more information on Toshiba’s new Symbio™ Smart Home Solution, visit http://toshiba-smarthome.com/, email [email protected] or call (615) 289-0901. For a first-hand look, visit us at LVCC, Central Hall – 14706 during CES 2018. Toshiba Visual Solutions Corporation is headquartered in Kawasaki City, Japan, and designs and manufactures a range of consumer electronic products and services, including TVs, audio and video peripherals as well as industrial/commercial-grade displays and signage solutions. Toshiba Visual Solutions Corporation serves clients worldwide and is committed to providing their customers with technologically innovative products as well as offering excellent solutions and support to meet the demands of the today’s consumer and business users. To find out more about the company, please visit http://www.toshiba.co.jp/tvs/.